We organise and advise on tailor-made cookery holidays, hands on classes, gourmet breaks and wine experiences in Italy, France, Spain and India. With Tasting Places discover the joys of cooking, using the finest ingredients and learning the secrets of dishes in a unique cooking experience. Whichever you choose, be it a week long cookery holiday, short gourmet break or one day Masterclass in one of our destinations, expect an informal yet intensive exploration of inspirational cooking. Locations, selected for their wonderful character and stunning surroundings, provide the perfect backdrop to relaxed and friendly classes hosted by some of the most innovative and exciting chefs in the world. We are now taking bookings for November 2018 for a 2 day masterclass on mastering the art of cooking in a wood fired oven. Join us for a 4 day pottery and cooking class in Le Marche. Classes can be tailored to your experience, learn to throw, fire your own pots in a raku kiln and take home your creations. 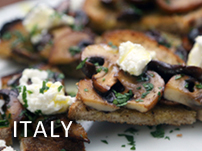 Plus learn to cook a range of delicious Italian dishes while the pots are drying!